Hervey Bay is a top whale watching destination in Australia, not only for tourists but also for researchers who have revealed some quirky facts about the giant mammals. Did you know humpbacks may sleep with one eye open, can stop blood flow to certain parts of their body, that sound is a more dominant sense than sight and that survival and gravity play a part in them growing to the size of a bus? 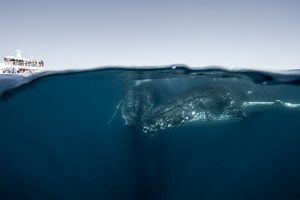 Pacific Whale Foundation senior research biologist Stephanie Stack said whales were conscious breathers which meant they had to think about going to the surface to take a breath. “If they completely fell asleep, as humans do, they would not be able to surface and breathe,” she said. Ms Stack said most sleep studies on marine mammals had been performed on dolphins in captivity and it was not really practical to put a humpback whale in a tank so researchers didn’t exactly know how whales slept but it was assumed they slept in a similar way to dolphins. “It’s a process called unihemispheric slow-wave sleep: that means they ‘rest’ one half of their brain at a time while the other half remains alert,” she said. Dr Wally Franklin of the Oceania Project said it was possible humpbacks slept with one eye open because they had to remain conscious at all times and be alert to hazards and predators. “They have conscious control over lots of different parts of their body,” he said. “They can control blood flow. Dr Franklin said that ability, combined with living in saltwater, helped them survive incredible flesh wounds from boat and propeller strikes and attacks by sharks and orcas. He said the brains of whales were much larger and more complex than humans and sound was a more dominant sense for them than sight. “They have a sound-processing capacity way beyond us,” Dr Franklin said. He said whales could make sounds at frequencies higher and lower than humans could hear and could also emit incredibly loud sounds – equivalent to a rock concert! “I’ve spent many hours out in the bay – we often listen to the whales at night,” Dr Franklin said. “What we hear is an incredible cacophony of many whales singing. Hear the whale songs recorded off Fraser Island via facebook.com/oceania. Ms Stack said whales had ears but not an external ear structure, just tiny openings which were difficult to see. “The inner ear is generally similar to that of terrestrial mammals,” she said. Ms Stack said one of the new theories on why whales grew so big was to trap sufficient body heat to keep them warm in the ocean. Dr Franklin said another factor was that humpbacks were not constrained by gravity so they could grow larger than what was possible on land. “The natural condition of the whale is weightlessness,” he said. “When they’re in the water, they don’t experience weight. “When they breach, they do experience the weight of their body. Dr Franklin said there were lots of other reasons for breaching including as a protection against sharks and killer whales and also a way to get their eye in their air to check out the location of vessels on the surface. From late July to early November, humpback whales rest, relax, socialise and teach their youngsters life skills in the calm waters of Hervey Bay, protected by Fraser Island from ocean swells. To find out how to join the researchers and other tourists watching humpback whales in Hervey Bay, go to whalesherveybay.com.au.